Proprietary Name: Earstill What is the Proprietary Name? Non-Proprietary Name: Calc Fluor, Carboneum Sulph, Chininum Sulph, Mang Met, Salicylicum Ac What is the Non-Proprietary Name? Earstill with NDC 68703-322 is a a human over the counter drug product labeled by Silver Star Brands. The generic name of Earstill is calc fluor, carboneum sulph, chininum sulph, mang met, salicylicum ac. The product's dosage form is liquid and is administered via oral form. HPUS Active Ingredients: Equal volumnes of each ingredient: Calc fluor 30C, Carboneum sulph 6C, Chininum sulph 6C, Mang met 6C, Salicylicum ac 6C. 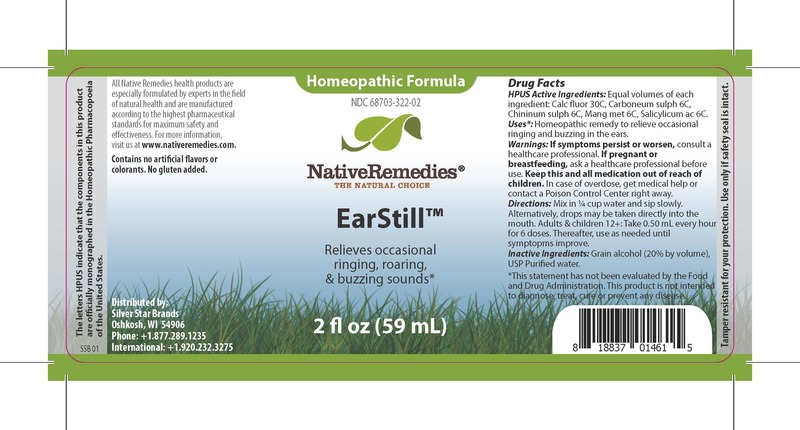 Uses*: Homeopathic remedy to relieve occasional ringing and buzzing in the ears. Directions: Mix in 1/4 cup water and sip slowly. Alternatively, drops may be taken directly into the mouth. Adults & children 12+: Take 0.50 mL every hour for 6 doses. Thereafter, use as needed until symptoms improve. Contains no artificial flavors or colorants. No gluten added.Tamper resistant for your protection. Use only if safety seals is intact.